The Majipoor Chronicles is a series of books that has been on my radar for a number of years, which is not surprising as Robert Silverberg began writing them in the early eighties. I'm only surprised that I didn't get to them before now to be honest and I actually nabbed this first one, Lord Valentine's Castle, from my daughter who got a bunch of sci fi books free from Devon Freecycle. As with all things - it was time. Sitting on a ridge overlooking the city of Pidruid, 'Valentine' is adopted by Shanamir, a young herdsman on his way to sell his beasts in the city. 'Lord' Valentine, the coronal (a sort of king) of the planet of Majipoor, is doing a grand tour and has reached this city, so it's party and parade time. It surprises Shanamir that 'his' Valentine seems to know nothing about it and is also very hazy about his own past. He points out the similarity in names but this makes no impression on Valentine whatsoever. Staying at an inn, Valentine is taken up by a troupe of jugglers and taught to juggle, as he seems to have a natural flair for it. He's offered a job touring with them and Shanamir decides to tag along. Valentine becomes friends with Carabella and Sleet, two of the troupe, but they also are taken aback by his lack of personal history and memories. Soon Valentine starts to get sendings - dreams sent from important people on the planet - and it becomes quite clear that Valentine is not just plain 'Valentine' after all... he's something else entirely. Valentine realises he must go to see The Lady of Dreams but it's one long journey across the continent and he has to persuade the alien with four arms who runs the troupe to go the way he wants him to go. On the way there are many hazards and adventures and if Valentine is going to retrieve what is rightfully his he will need all the help and support he can get. I couldn't make up my mind whether this book was science fiction or fantasy. It's actually a mix of both. It's made clear that Majipoor is a planet that has been settled by humans but that they share the planet with other intelligent species. On the other hand the characters are typical fantasy ones and the entourage Valentine collects around him is very like many classic fantasy stories such as The Belgariad series by David Eddings or the Dragonlance books by Margaret Weis and Tracy Hickman. It matters not to be honest and this is just me trying to pigeon-hole a book, in my head it felt like science fiction and 'classic' sci fi to boot. I have to say that I enjoyed Lord Valentine's Castle quite a lot. I always love a good 'travelling' fantasy or sci fi book and I think that's probably because I enjoy travel books and those always feel like reading a travelogue from another planet. The book is quite densely written. There is much description of the flora and fauna and of the huge cities and a great deal of imagination is displayed in that department. Silverberg obviously has a very clear picture of the planet in his head and quite frankly, it's amazing! Character-wise it was possibly a tiny bit lacking. I liked the characters but I didn't love them, didn't feel close to them as is sometimes possible with a really fantastic book. On the other hand I certainly think I liked them 'enough'... which is fine. Truthfully, I think the real joy in the book for me was Silverberg's world-building. Majipoor really is an amazing place and the alien races he very skillfully introduces remind me a bit of Ursula le Guin and her brilliant depictions of other races in books like The Birthday of the World. I won't say this book is as good as her writing but it's not that far off. And it fitted the bill nicely for what I felt like reading which was a sci fi of the classic kind which took me away to an amazing world. 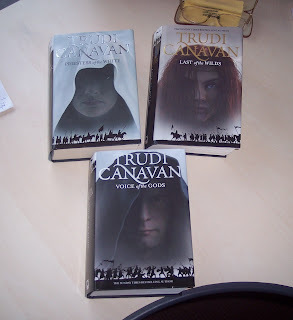 So, this was the first book of the Majipoor series and off I went to see what comes next. Which was where the confusion set in. I was expecting a continuation of Valentine's adventures because of the unresolved issues - instead I found that a book of short stories based in the Majipoor universe comes next. 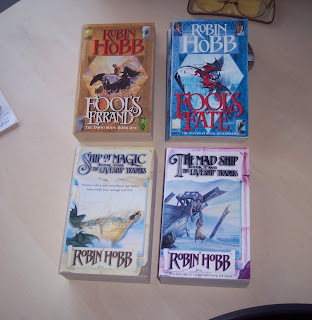 I'll have to investigate further and see what my daughter has too as I would really like to continue with these books. The problem is, I don't think it's a series or trilogy in the concise sense that we've become used to over the past ten years. I think they might be more akin to Anne McCaffrey's Pern books or the Darkover series by Marion Zimmer Bradley. We'll see. It's ten days since I posted here! It wasn't intentional, I've been a little busy - I have been reading though, just not as quickly as I would like. 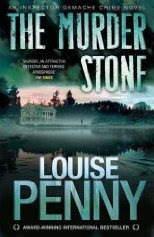 Anyway, The Murder Stone by Louise Penny has to go back to the library today so I'll write a bit about it while I still have it: always easier! Armande Gamache, a chief inspector with the Sureté du Québec, has taken some time off for his wedding anniversary and taken his wife, Reine-Marie, to the Bellechasse, a hotel in the forest not too far from the village of Three Pines. It's not their first visit there, they spent their wedding night at the hotel and have been there every year since. It's an expensive, exclusive place, wonderfully quiet and peaceful and they love it there and know the owners and staff well. Also staying there are the Finney family, elderly mother and step-father, three middle-aged siblings and one grandchild. Gamache cannot help but study the family. He finds them a strange lot indeed and comes to the conclusion that there are problems in the family. Then a fourth sibling arrives and Armande and Reine-Marie are stunned to find that they know the couple very well indeed. Anyway, enough day dreaming, any negative points about the book? A couple of minor ones. I found the constant harping on about how ugly Mr. Finney was, grating, and wasn't quite sure what the point of that was. Surely not to infer that those who are less than beautiful are more likely to commit murder? And I think it was Susan at You Can Never Have too Many Books who mentioned some while ago that the sudden appearance of four-letter word swearing was grating on *her*. I agree. I know some men swear like that and maybe policemen especially (though I doubt it), so, likely as not, it's a bit of realism instilled into the books. But it grates on me too and takes me out of the story, and I really don't care for it. Just my opinion of course, Your Mileage May Vary, as they say. All that said, I thoroughly enjoyed this instalment of these Canadian mysteries (there's a new one out soon, or maybe even out already). I reckon Canada is a wonderful country to set mysteries in and Kay has introduced me to another series, by Vicki Delany this time, and set the other side of Canada, in British Columbia. Can't wait to start the first one, In the Shadow of the Glacier, which is already on my tbr mountain. Are there more mystery series set in Canada? If you know of any please let me know. Not reading but connected in way - I went to see the new Sherlock Holmes movie yesterday and thoroughly enjoyed it. I agree with a few people in that I don't see these movies (I believe there's to be a sequel) becoming the definitive Holmes... that accolade belongs to the version with Jeremy Brett, in my opinion. 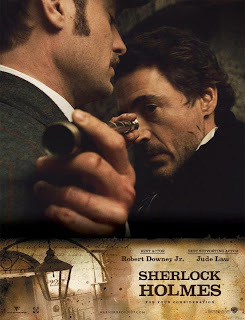 But this new version, with Robert Downey Junior and Jude Law as Holmes and Watson, was huge fun and I loved it. I was particularly impressed with the sets - wonderful grimey, London slums, amazing street scenes which looked as though they'd actually used London, and then suddenly you got a view right down the Thames from one of the bridges with the old buildings and sailing barges. Fantastic. The plot was a bit so-so (though quite acceptable) but was more than made up for by good performances from Robert Downey Jr. (excellent English accent), Jude Law (have never really been a fan but he was good in this), Mary Reilly (Caroline Bingley in the 2005 film version of Pride and Prejudice) as Mary Morstan, and Geraldine James as Mrs. Hudson. And the dog was wonderful too!! Can't wait for the next one now. Now on to some books. Two this time, Iron Kissed by Patricia Briggs and The Ice Queen by Alice Hoffman. First up : Iron Kissed. This is book three in Patricia Briggs's series about Mercy Thompson who isn't a werewolf but a 'walker' who can change into a coyote at will. Mercy owns her own car mechanic business after having been brought up with a werewolf pack. She moved away to be independant but ended up nextdoor to Adam Hauptman, the alpha male of the local 'three cities' werewolf pack in Washington state. This story sees Mercy trying to prove the innocence of her former boss, Zee. He's a fae, a group of beings shrouded in mystery, but Mercy starts to learn more than she ever wanted to know about them when she's asked to their reservation to use her coyote senses to sniff out the serial murderer of five fae. Zee is arrested but Mercy knows he's innocent. How can she prove it? Add to this the fact that her life is complicated enough as she knows the time is fast approaching when she will have to choose between alpha male, Adam, and Samuel - her childhood sweetheart from her old pack. How this is to be achieved without serious bloodshed, she has no idea. I can't overstate how much I love this series. I particularly liked this one where more is learned about the fae and their history; Briggs is a very imaginative author and deals with this very well indeed. There's a nice bit of sexual tension in this one too as Mercy deals with her feelings and the repercussions of choosing one werewolf over another. Truthfully, I like the fact that these books are not over sexualised like some of the current paranormal romances; I much prefer tension and hints to graphic descriptions. Book four is already on my tbr pile and there's a new one out in March I believe. Next up: The Ice Queen by Alice Hoffman. A young girl, in a fit of jealousy, wishes her mother dead as she goes out the door to celebrate her thirtieth birthday. The mother dies that night in a car accident and the girl turns off her feelings, thinking that when she wishes something awful, it will come true. The girl and her brother are brought up by their grandmother until she dies, when the brother, Ned, by then moved to Florida, persuades his sister to move from New Jersey to be close to him and his wife. Not long after she moves she's struck by lightning, which causes some peculiar physical reactions. She's forced to join a lightning victims study where she hears about Lazarus Jones who was struck, died for forty minutes, and then came back to life. Seeking him out she discovers a man whose very touch burns anyone who touches him, but depsite this she embarks on an intense love affair with Lazarus. 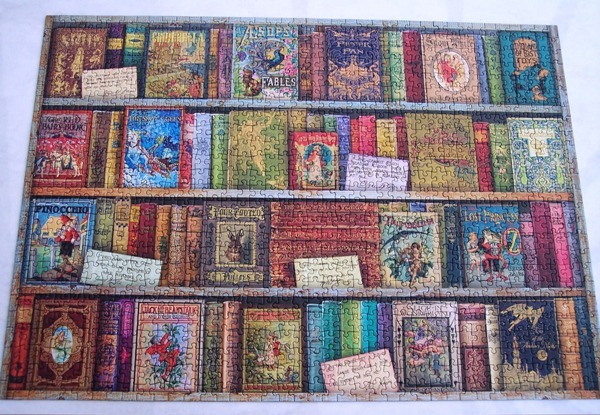 One night, while working alone in the library, she sees her sister-in-law drive up in her nightie and deposit a book in the overnight book-bin. It's a book about ways to die, a subject she has become an expert in, but what is her sister-in-law doing with such a book? Does her brother know about it? And how can she find the answers to these questions and still maintain her ability to feel nothing and love no one? This book was actually a random grab from the library but just recently I saw that Robin at A Fondness For Reading had chosen it as her book of the year. I can see why. It's beautifully written, almost heart-breakingly so, and in the first person which is a particular love of mine. We never do discover the girl's name and it wasn't until I'd finished the book that I realised it... that's good writing! Interspersed with the beautiful prose are fascinating facts about people who've been struck by lightning. This is a sort of a fantasy book so some will be make-believe I'm sure, but I suspect there's a grounding of truth there too and I found that fascinating. And of course I always love a book about secrets and there are many in this story. Truthfully, it is rather a sad tale but at the same time ultimately uplifting - I cried during the final chapters and not many books give me cause to do that. Superb, and certain to finish among my favourite books at the end of the year. Has anyone got any other Hoffman recs? This photo was shown on the BBC News tonight and I thought it was stunning enough to post here. 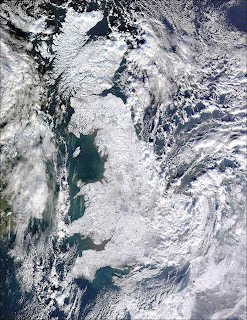 This is the snowfield that is Great Britain at the moment, taken from space by NASA. As you can see there is very little of the country that's not covered by snow. I'm in my fifties and I honestly cannot remember this happening before. Even in the big freeze of 1963, the part of Cornwall I come from saw no snow whatsoever. This is just amazing. I've been reading The Tenant of Wildfell Hall (for some reason I keep wanting to say 'Wildfowl' Hall...) off and on since the new year started. I'm not all that inspired by it but will persevere. I suspect, like a lot of books, it will get better as it goes along but when I went down with a cold several days ago I decided I needed a faster paced, more entertaining, book to read while I sniffed and sneezed by the fire and the snow came down outside. (We are currently snowed in.) 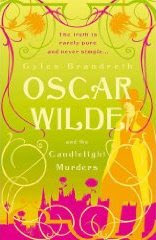 To that end I picked up a book from my tbr mountain, Oscar Wilde and the Candlight Murders by Gyles Brandreth. The narrator in the this fictional story is one, Robert Sherard, who was the great-grandson of poet, William Wordsworth. 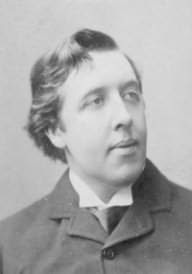 He existed in real life and was, in fact, a good friend of writer, poet and playwright, Oscar Wilde. The story begins in 1889 with Oscar Wilde arriving at an address in London to meet a pupil of his, sixteen year old, Billy Wood. What greets him as he enters the room is a dead body. Billy has been brutally murdered but not only that, he is surrounded by lit candles - the murder was a ritual killing. Oscar takes flight and doesn't report the murder until the next day. By which time the body has been removed by persons unknown and the police think he might have hallucinated the whole thing. Enter Arthur Conan Doyle, a young writer who has just started a new crime series about an unusual detective, Sherlock Holmes. Oscar is completely smitten with the two books published so far and the two writers immediatelty become friends. Arthur's advice to Oscar is to go and see a close friend of his, Inspector Aiden Fraser, at Scotland Yard, who he is sure will take him seriously. Accompanied by his close friend, Robert Sherard, Oscar does just this but, in the event, even Inspector Fraser is sceptical about the writer's story. Well then, on the surface this was a light, quick read that is fun and perhaps not as dark as it might have been. Gyles Brandreth is well known in the UK as a TV presenter and one time Tory MP and with his sense of humour you might expect this kind of novel from him. One of the reasons I particularly wanted to read this is because he is one of the few people who appears on TV to promote books and encourage people to read. I personally have a lot of time for him. The thing about this book though is that there is a bit more to it than is immediately obvious. It's clear that Brandreth has done a lot of research into Oscar Wilde's life and it's all very interesting. I had no idea for instance, that he was married with two sons and was a devoted family man. Things about Wilde's trial are mentioned which leave the reader to speculate on whether or not his trial was a fair one. And Wilde's lifestyle, flamboyant and generous, is gone into in great detail. This is not an explicit book in any way but the alternate part of the writer's life is talked about in a matter-of-fact manner and that might not be for everyone. You can probably tell that I liked this book rather a lot. I like it when a book inspires me to find out more about some facet of its content and in this case it's Oscar Wilde himself. I own the biography by Richard Ellmann so will read that this year. I'll try to watch the Stephen Fry movie and I'll certainly be reading The Picture of Dorian Gray which is mentioned a few times in this book. I'm already a Sherlock Holmes reader so that aspect is already covered! Brandreth has so far written three of these Wilde novels, the next being Oscar Wilde and the Ring of Death. I'm assuming there will be a finite number as the books start in 1889 and Wilde's trial was in 1895 I believe. Perhaps Mr. Brandreth didn't want to get into an endless series, I don't know. I do know that I will read them all as this first one was cracking good read. My first book for the Year of the Historical challenge, which is being hosted by Lurv A La Mode. This post is really for my own records and is an update of the one I did on the 28th. November 2008. Basically it's because I've updated it since then but also to save me from having to go back that far to update. This is a serious thing for me because this list really does help me to keep track of the series that I'm reading. What it also proves is how slack I am at finishing them! *And* what an easy target I am for shiny new ones. The other thing that's starting to be apparent is that I'm doing better with crime series than I am my other love... fantasy. Oh well. ' Things change' as they say. And if anyone can think of any other series that I really ought to be reading please feel free to leave a comment. Well, here it is the 2nd. January 2010 and I'm still three books behind for 2009. So it's catch-up time today and I'll do those three quickly and then I'm all up to date for the start of 2010. First up is a charming little book that I gave to my grandaughter last Christmas - The Miraculous Journey of Edward Tulane by Kate Dicamillo. 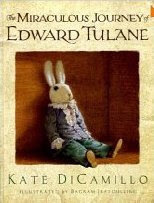 Edward Tulane is a china rabbit that is owned by a small girl living in New York city. He is basically rather arrogant and vain and doesn't really return the love his owner feels for him. On a trip across the Atlantic by ship, Edward is thrown overboard and thus begin his adventures in the wide world, and his introduction to proper feelings and emotions. Next up A Christmas Guest by Anne Perry. It's several weeks since I read this. I intended it to be my Christmas week read but someone else reserved it from the library (the cheek of it!) and I had to read it mid-December instead. Mariah Ellison isn’t merely disappointed to learn that she won’t spend Christmas at home with her married granddaughter: she is furious. Instead, Grandmama is being packed off to a house in the Romney Marshes to stay with her ex-daughter-in-law. Never having got on with Caroline, Mariah much disapproves of her new husband: decades younger than her, Joshua, an actor, is scarcely even respectable. There will be nothing to do, no one to visit, and no doubt the terrible weather will make even taking a walk impossible. It is going to be the worst Christmas of Grandmama’s life. As if that weren’t enough, another visitor is foisted on the household. Then something shocking and quite unexpected happens. Has a crime been committed? 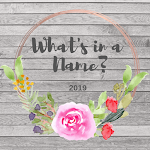 Grandmama is surprised to find herself turning detective – another profession she deplores – and proving extremely good at it. This is the second of Anne Perry's Victorian Christmas books that I've read. I like them a lot! They're well written, accurate in setting, and rather atmospheric. Most of all I liked this one because the detective was not young and good looking but a woman in her seventies who was awkward and unpleasant and had a few secrets of her own in her past. This is rare in my experience and all power to Anne Perry's elbow for doing it. 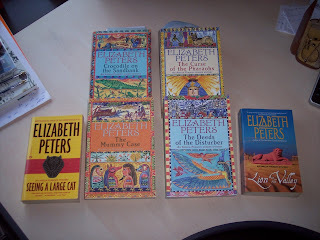 I shall be searching out more of these and this year I really must start on one of her series. Any special recs anyone? Last but not least is The Land of Silver Apples by Nancy Farmer, book two of her 'Sea of Trolls' trilogy. Quite a few months have passed since trainee bard, Jack, and and his sister Lucy's adventures in Norway with the trolls. Life has settled back into the normal routine but it's clear that Lucy is not 'normal'. Jack and the bard take her to a monastry famous for its cleansing of troubled souls but during the ceremony Jack causes an earthquake and the Lady of the Lake steals Lucy. Jack, Pega, a freed slave, and Brutus, a slave, go off in search of Lucy but their way is down the now empty well and underground through The Hollow Road to find the land of the elves. It's Jack's biggest test so far. Great stuff... just as good, if not better, than the first book. Nancy Farmer has clearly done her homework as the historical setting for this book - around the time of the Viking invasions of Britain - strike as very realistic. Life is hard and she makes no bones about that. She also makes no bones about people's failings and no one is perfect in these books, including Jack. I like that ambivilence very much indeed. A good, pacey yarn, perfect for children over 12 I would have thought, and adults who like YA fantasy.